My first real mountain backcountry experience didn’t come until I was 24; it was the one that started it all. I experienced the call of the mountains for the first time while on a backpacking trip in Yosemite a couple of years ago. My buddy and I camped out on a granite slab at 9,000’. Mt. Hoffman — with its slopes still covered in snow in July — defined the distant skyline; beckoned me to come experience the wondrous magic so eloquently described in much of John Muir’s writing. So I listened. My second backcountry experience, in Sequoia National Park, took me closer to the mountains — but it still wasn’t close enough. My newly discovered thirst for adventure became more mountain-centric with each endeavor; I soon realized that hiking in their presence would not be enough to quench my thirst. I had to climb them. So I did. A teammate climbs Mt. Whitney’s snowy couloir during a winter ascent on the Mountaineer’s Route. My first mountaineering experience was facilitated by Ian McEleney, AAI’s resident Sierra Nevada guide (check out the interview we did with him last year). We tackled a winter ascent of Mt. Whitney — the highest point in the contiguous United States — as the final objective in AAI’s Winter Mountaineering in the Sierra course. I was hooked. Climbing Imja Tse (20,305’) in Nepal was the hardest thing I’d ever done. Full Disclosure: AAI was pretty stoked to work with me, so they covered the AMTL I course’s $2,190 tuition in exchange for coverage on IndefinitelyWild. Andrew and Beau assess glacier conditions while our team determined if an ascent of Silver Star Mountain would be possible. The AMTL program consists of four 12-day segments that have been designed with the goal of rapidly developing well-rounded technical leadership skills in the alpine environment — essentially, enabling participants to lead a climbing team up an alpine objective, more colloquially known as a mountain. AMTL Part I — the course that I took — helps climbers to develop a very comprehensive set of alpine climbing skills for rock, snow, and ice, starting with the basics. The course curriculum covers skills in four categories: Alpine Travel and Climbing Skills, Objective Hazards Evaluation and Self-Rescue Skills, Leadership Skills, and Environmental Protection Skills. While the course teaches a plethora of technical skills, good mountain judgement is equally emphasized; both are practiced and executed on a variety of beautiful and challenging North Cascade climbs. A van arrived at the hotel to pick us up just before seven. Beau — a Texas-bred, Manhattan-based ER doctor specializing in pain medicine — and I had spent the previous day getting to know each other while indulging in the biggest bulk foods section in the biggest grocery store I’d ever seen — WinCo. Beau and I were both signed up for AMTL I (though he’d also go on to take Part II immediately afterward) — but the first half of our course overlapped with Alpinism I, an introduction to mountaineering. We met up with the rest of our group, as well as our guides Andrew and Jenny, at AAI’s headquarters and gear shop. We spent the next couple of hours doing gear checks, squaring away last minute rentals, and repacking before embarking on the two-hour drive to Mt. Baker. Brittany looks down the moraine as we hiked up Mt. Baker’s Railroad Grade. We arrived at the trailhead by noon; began the five mile hike up to Sandy Camp — arriving just as the sky began falling out. By the time we finished setting up our shelters, the rain had subsided; we spent the rest of the cold, cloudy evening learning about our harnesses and hardware; and then Andrew and Jenny showed us the ropes, literally. The rope is a climber’s most valuable asset; good rope-management skills are the key to efficient climbing. We learned a variety of knots: retrace figure-eights (useful for tying onto the end of a rope), butterflies (useful for tying onto the middle of a rope), and overhands. Some hitches: cloves; munters (both of which serve a multitude of purposes in the alpine environment.) And the double-fisherman’s bend (useful for attaching the ends of two ropes together, like in a prusik.) They also taught us how to flake (remove the rope’s tangles) and how to coil. Butterfly coils are useful for storing or transporting a rope. Mountaineer’s coils are useful for carrying slack on the end of a rope while traveling as part of a rope team — in the event that you may need slack to set up a crevasse rescue system. Moving quickly through class 4 or low 5th terrain? A kiwi coil (pictured) will allow climbers to take in slack from the middle, while tied into the ends. The next morning we got out on the snow for the first time to practice self-arrest. You ever see one of those super intense (and super fake) mountain movies where the hero is sliding uncontrollably down the slope right before flying off of a cliff? Well, the idea is to assess and mitigate risk and not put yourself in a situation where that happens. In the event that you do fall, you need to stop your fall — self-arrest. That is best done by plunging the pick of your ice axe into the surface while defiantly kicking your feet into the snow. Don’t have an ice axe? Your trekking poles or even your elbows can work in a pinch. A jumbo-sized Hyperlite Mountain Gear Cuben Fiber Stuff Sack ($37) made the perfect makeshift snow-anchor. If your team is traveling up a snow slope that’s too steep for self-arresting after a fall it’s probably a good idea to place protection in the form of snow anchors. Snow anchors can be created from just about anything, whether it’s a dedicated snow picket, an ice axe, or even a stuff sack buried in the ground. We spent the next hour learning how. A cross-section of one of Mt. Baker’s glaciers shows its composition. We wrapped up our lessons for the day with some glaciology — the study of glaciers. Andrew and Jenny taught us how they form. How they move. We identified hazardous areas; how those conditions would affect route finding. After dinner a few of us went up onto a ridgeline across from camp to watch the sunset over Puget Sound and the Twin Sisters. The 8 oz. Mountain Hardwear Ghost Whisperer Hooded Down Jacket ($350) kept Brittany warm. The next morning we were back on the snow for a lesson in cramponing technique. The key to good cramponing is to ensure that a maximum number of points are in contact with the snow or ice in every step. And: don’t poke holes in your pants. Andrew provided a standing snow-belay by running the rope through a carabiner that had been attached to an ice axe; plunged into the snow. Afterwards we learned several different belaying methods for snow. Belaying is a technique used to provide tension for a roped climber, so that in the event of a fall, the climber doesn’t fall very far. In the snow, the belayer can provide a variety of different belays, depending the steepness of the pitch. They can be administered either standing or sitting, and using just the body, or a combination of hardware (like an ice axe and a carabiner). On the third day, we retired before the sun did, because at midnight we would wake and begin our push for Mt. Baker’s summit. With no moon to guide us, headlamps lit the way. The mountain was shrouded in darkness for most of our ascent; we traveled unroped across the icy glacier in an area with little danger from crevasses (deep cracks in the glacier) for the first couple of hours. Eventually we roped up and continued the slog over the snowfield and throughout several objective hazards until we reached the famed Roman Wall. Our rope team navigated a tricky exposed section on the Roman Wall. The Roman Wall is a steep, 1,000’ slope; it represents the last obstacle for climbers before they reach Mt. Baker’s summit plateau. Midway up, we encountered a tricky exposed section of the glacier; Andrew hammered a picket in allowing us to safely climb past. After a few hundred more steep vertical feet, we reached the plateau and marched to the summit and the rising sun. We hung out on top for a bit, taking in expansive views of the North Cascades, signing the register, eating snacks, and of course taking pictures — typical summit fare — before beginning our descent. We made it back to Sandy Camp before noon; promptly passed out in our tents. We spent the rest of the evening replenishing our energy before going back to bed a second time. Andrew demonstrates a 3:1 pulley system used for crevasse rescue. Our final day on Baker was spent learning crevasse rescue systems, which are invaluable for climbing parties that travel on glaciers. Basically, in the event that someone falls into a crevasse, they’ve got to have a way to get out, whether it’s through self-rescue, or with a rescue system. The process itself is pretty complicated, but AAI has a great, detailed article on it. After learning the crevasse rescue systems, we headed back down to Sandy Camp, packed up, and hiked out. We spent the last night of Alpinism I at some campgrounds in town; on our final day we hit the crag for some introductory sport climbing. Much of this would ensue. After saying goodbye to our team from the past week, Andrew, Beau, and I regrouped and headed back up to the North Cascades — this time at Washington Pass — for the second half of AMTL I. By the time we arrived at Silver Star Creek Campgrounds and claimed our site it was already late afternoon, but we made the most out of our time with a sunset cragging session at Fun Rock — where Andrew led Beau and I on our first multi-pitch (sport) climb. We got up at five the next morning to tackle Liberty Bell’s Becky Route — a popular four pitch, 5.6 route, which would also be Beau’s and my first multi-pitch trad climb. We hit the trailhead at 6:30 am sharp; knocked out the relatively short approach by eight. Once we reached the start of the climb, we harnessed up — and then Andrew taught us to clean the route as we followed his lead. The first pitch led us through a narrow chimney. Beau climbed second; I followed afterward, cleaning as I went. Beau and I switched positions between each pitch — cleaning and climbing as we went, while Andrew belayed from the anchors above. Andrew was ready for a nap; Beau simply preferred to take in the views. Finally we reached a small plateau, and then scrambled up one last fourth class section to the summit. Success! After the typical summit fare, we began downclimbing — then did two rappels down to the start of our climb, hiked out, and went back to camp. The Liberty Bell group as-viewed from Silver Star’s approach. Liberty Bell is on the far right; South Early Winters Spire is on the far left. Liberty Bell was our warm up; game day began the next morning, but this time at six. Another quick approach led us to the base of South Early Winters Spire — the highest peak in the Liberty Bell group. We’d be tackling a seven-pitch, 5.8 variation of its Southwest Rib. The 5.8 oz. 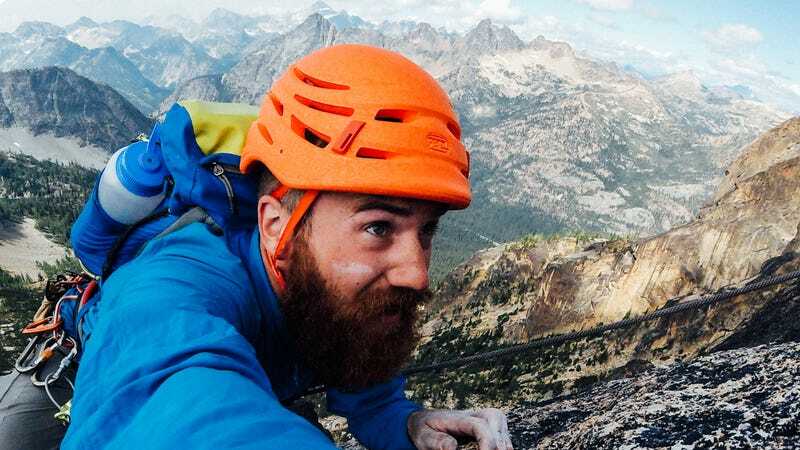 Petzl Sirocco Helmet ($130) provided ultralight protection from rockfall and other potential falling hazards. By now, Andrew had us dialed in pretty well; we made efficient work of each pitch. We’d belay. Andrew would lead. Set up an anchor. Belay. We’d climb. Like clockwork. The first major crux (the most challenging move in a pitch) of the climb came in by the second or third pitch. There was a slight overhang with a fist jam (a large crack); in my effort to complete the move, I made the mistake of out-climbing the protection that helped protect it. Big mistake. Leaving gear behind was not an option; but neither was downclimbing. I straddled a corner, leveraging my leg below the ledge and leaned back, just within reach of the cam. It was stuck. I wiggled it. Pulled again. More wiggling. Finally, I got it out, and continued climbing up to the belay. The next crux came a couple of pitches later. Rated a 5.7, it was easy to see why the double crack had been named “the Bear Hug.” I climbed up as soon as Andrew had set up our anchor, stopping midway in between to grab shots of Beau. The next several pitches were a combination of relatively mild face climbing, and some low-fifth class moves. We reached the summit block at 1pm, brewed some coffee, and admired the views. We downclimbed via the easier South Arete; at our request, Andrew taught Beau and I how to short-rope (sometimes also referred to as “simul-climbing”) along the way. Short-roping is an advanced technique used for moving quickly through fourth and low-fifth class terrain where there is a lower potential for catastrophic falls. The stronger climber leads through a section, then uses terrain features to provide a belay while the partner climbs. Though short-roping technically wasn’t a part of the AMTL I curriculum, it’s incredibly useful for accessing a huge variety of alpine objectives; Andrew felt Beau and I could handle it. We did. After short-roping down several hundred feet, one final rappel landed us back on the ground; we hiked an hour back to the car. The three of us slept in a bit the next morning; stuck around Mazama for some crag time at Fun Rock and to plan our final alpine objective. At the crag, Andrew taught us how to lead sport routes — placing quickdraws for protection along the way; building anchors at the top. Beau and I took turns climbing and cleaning until we were confident enough to lead them on our own. Once we finished up at the crag, the three of us drove down to the Mazama Store to plan our final climb. Beau and I would lead an attempt on Silver Star Mountain the very next morning, while Andrew took a backseat to climbing — and planning. Silver Star is an 8,876’ glaciated peak; it would offer plenty of opportunities to practice everything that we had learned during the previous ten days. Beau and I thoroughly studied two different guidebooks’ descriptions of the route, making comparisons from each. We then checked the weather, which would be a determining factor on what time we started, or if we would even go at all. Finally, we estimated the time it would take to tackle our objective. Eventually we decided to brave light rains and get an alpine start, hitting the trail at 3 am. Beau stares up at Silver Star Mountain — our final alpine objective for the course. Silver Star is often tackled in two days; we’d be attempting it in one. The approach, though less than four miles long, was comprised mostly of steep, sandy terrain. With 5,500’ of gain to the summit, they were four long ones. The first couple of miles went pretty quickly; we arrived at Bench Camp an hour and a half ahead of schedule — though we lost that time afterward due to route finding issues while traveling up a series of steep gullies. We got back to the proper route by sunrise; arrived at Burgundy Col, our second waypoint, within the hour. After a quick snack, we dropped 300’ down the other side of the col, in a steep, loose gully. Had there been snow, our descent would have been much easier. Then we were on the glacier, but it was so melted out, we could barely tell. The next section would have been comprised of snow travel in more ideal conditions, but even Washington had been experiencing a drought. Instead, we scrambled up a bunch of fourth class rock until the Silver Star Glacier — and the summit — was in view. Andrew and Beau assessed glacier conditions and potential routes for the final push to Silver Star’s summit. With no time to waste, we strapped on our crampons and got out onto the ice. The three of us were a bit behind schedule, but still within the realm of a possible summit. As we advanced, however, the glacier’s conditions began to deteriorate more and more. Beau and I observed and attempted different routes, while Andrew patiently followed along. This was a student-led objective, after all. Unfortunately, Silver Star’s glacier was pretty rotted out; Beau and I had reached the point where continuing would be an endeavor beyond our own leadership abilities. Just 500’ below the summit, the two of us — team leaders — made the call. We’d go back down. Andrew provides a terrain belay for a more protected descent down the precarious glacier. With our decision made, Andrew — who had remained quiet for most of the day — spoke up. We’d give the summit one more shot, with his leadership this time. Our small team continued up the right side of the glacier, following the guidebook’s normal route as far as we could go. Andrew climbed first and provided belays. Even then, we didn’t gain much ground; we could hear the ice sweltering under it’s own weight. It was time to go. The return hike sucked, but daylight made for easier navigation; by 2pm we were back at the van. That evening, we went into town for showers and groceries. Jenny and another guide had used their time off to go climbing in the same area; we all had a cookout that night. On our final morning of AMTL I, we hit the crag once more to practice leading — and learned to take falls. Though this was also not on the official course curriculum, it would provide Beau and I with some additional hard skills that we could take home and practice on a regular basis, if alpine objectives weren’t accessible. By noon we had broken camp down, packed up, and were bound for Bellingham, concluding our incredibly intensive and rewarding training. An overview of some of the gear required for mountaineering. Mountaineering Gear. Backcountry camping gear. A technical layering system. This is an expansive list that can change pretty drastically depending on conditions — but I’ll be covering the basics in my next post. The GoPro Hero4 Session ($400) + The Strap ($60) allowed me to capture unique 3rd-person perspectives of myself while climbing thanks to its compact size. If the mountains are calling — there’s not a more encompassing program in the country to prepare you to answer. AAI has this course dialed in. The curriculum was expansive; both Andrew and Jenny did an incredible job of teaching it. I came out of the course with a greater understanding of the mountains; that directly translated to confidence (not cockiness) in the alpine environment. Now I’m ready to start tackling some alpine objectives on my own; I’ll be putting my newly-acquired skills to use over the next couple of weeks while climbing in Alberta. See you out there.